Turn any shirt into a nursing shirt with the Undercover Mama nursing tank. No more fiddling with awkward nursing shirts. Wear this clip on nursing camisole with any shirt and you'll instantly have a comfortable, modest nursing option that works! Just clip the Undercover mama nursing camisole to any nursing bra. Then, when you release the bra cup for nursing, the camisole moves with the bra cup but keeps your stomach covered. No matter how much baby wiggles and squirms, you stay covered. General rule, one size down from your shirt. If you wear a medium shirt, you need a size small Undercover Mama. Try the Undercover Mama, it really works! You'll love having an endless variety of nursing tops since the Undercover Mama tank turns any shirt into a nursing top. You'll save money - and save yourself from the boring nursing tops that seem to be everywhere! Undercover Mama tanks attach to any bra! Each shirt includes two attachment options. SHOP WITH CONFIDENCE! 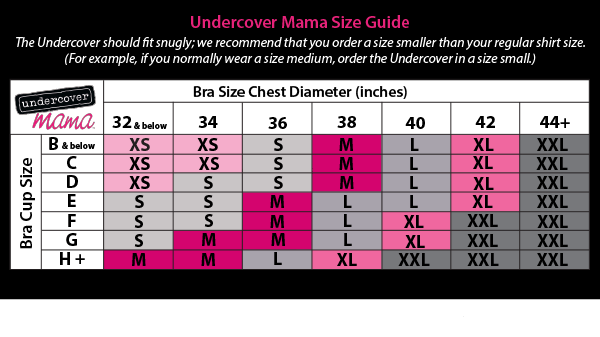 Undercover Mama undershirts are constructed of quality material and are made to last. Your Undercover won't bunch up, slide around, or ball up after washing.They fit where you need them to while keeping you covered in style. The generous length allows you to tuck it in or go for a layered look. "Make ANY Shirt a Nursing Shirt"TM with Undercover Mama. The basic black is our most popular color. It looks sleek under your favorite top and adds a natural slimming effect!